Welcome to the Hotel Torino! No not in Turin. In Eritrea. 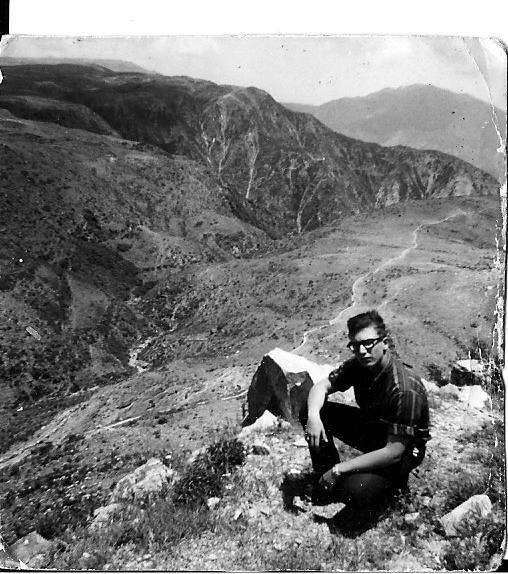 First you need some background on how geeky Toritto wound up in Eritrea in 1964. No surprise. We had troops there. We have troops everywhere. One Spring day while at Ft. Devens in Ayer Mass. I received an order to go to Boston. Yippee! “And what is my mission in Boston sir?” asks the dumb PFC. “Get a passport” is the reply. Where can I be sent where I can’t travel on my Army ID card wonders I.
I soon found out. Asmara. Where? 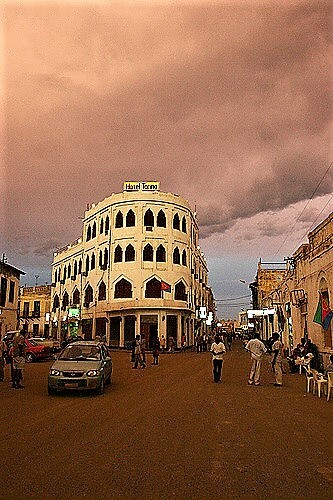 Eritrea. Where’s that? Near Ethiopia. Now Ethiopia an Italian understands. We did split two wars. Eritrea is actually a former fascist Italian colony on the horn of Africa and in 1964 was under control and U. N. mandate of Ethiopia. 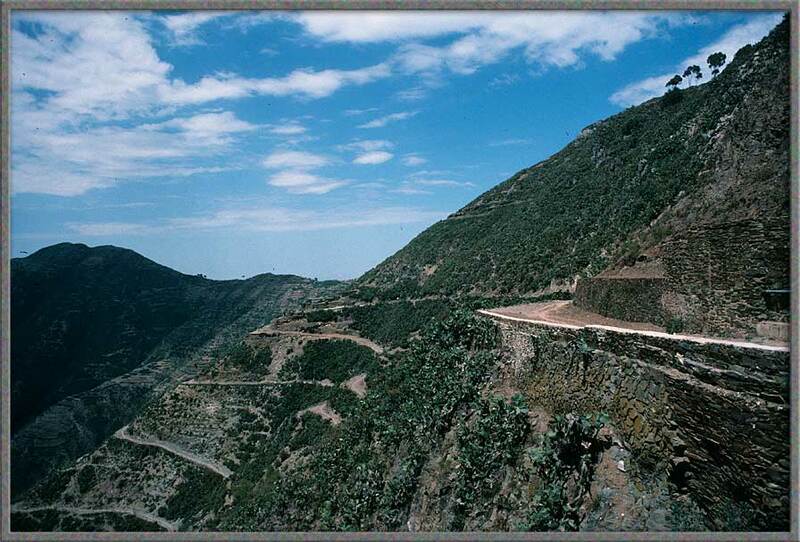 Ethiopia wanted to keep Eritrea as it was her only outlet to the Red Sea. Italians had occupied Eritrea for decades – Mussolini wanted to build the new Rome. Italy had also occupied Libya but Libya and Eritrea alone do not a new Roman Empire make. Everywhere else in Africa and the Middle East was already occupied by British or the French. Eritrea would be the jumping off point for the invasion of Ethiopia. Italy had been defeated by Ethiopia in 1896. Mussolini took no chances. He used planes, artillery and poison gas against troops on horseback and armed mostly with spears or outdated rifles. The Italian colonists followed the army and settled in, stayed on during WWII when the British took Eritrea from Italian troops and stayed on still rather than return to a war shattered Italy. They were still there in 1964 – some 30,000 in Asmara alone. My name fit right in. 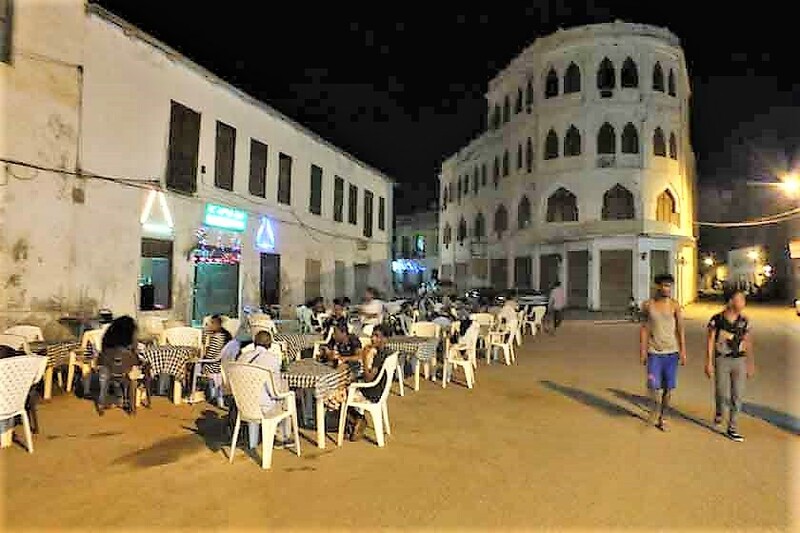 After being in Asmara a couple of weeks I discovered I had done most everything there was to do except make the trip to the beach at Massawa, the port on the Red Sea some 70 or 80 miles away. Was I an adventurous sort? Only one problem. Asmara was on a plateau 7,600 feet up. Getting to Massawa involved a truly treacherous 40 mile drive down a two lane narrow switch backed road with shear cliffs on one side, no guard rails and traffic, including trucks coming in the opposite direction. And they drove like Italians. After reaching sea level it was go like gang busters to cross a forbidding inhospitable virtually uninhabited desert flatland where temperatures reached 120 degrees in the shade. If you could find shade. No problem. The brave soldiers of the all conquering United States Army estimated it was a six pack of beer trip for each man each way. My first trip to Massawa was in the back of an open ‘49 Willies Overland – high adventure indeed. Down the mountain I didn’t look. Kept my eyes closed. Across the flats I kept hearing the theme from Lawrence of Arabia in my beer filled head. Poured some of the beer on my head to keep cool. My face and arms had that crispy look. The annual mean average temperature approaches 86 °F and is one of the highest found in the world. In mid summer themperatures reach well over 100 degrees. 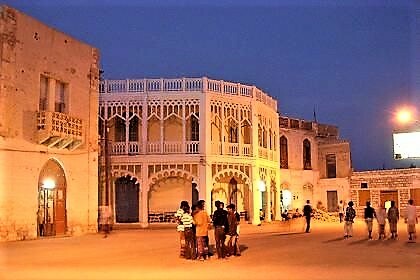 Massawa, being on the Red Sea is noted for its very high summer humidity as well despite being a desert city. The combination of the desert heat and high humidity makes the “comfort” index seem even more extreme. The sky is usually clear and bright throughout the year. We stayed at the beach. Lived in sleeping bags and lean-tos. Barbecued over fires. Walked in the Red Sea. Got some more sunburn. Stayed wet. 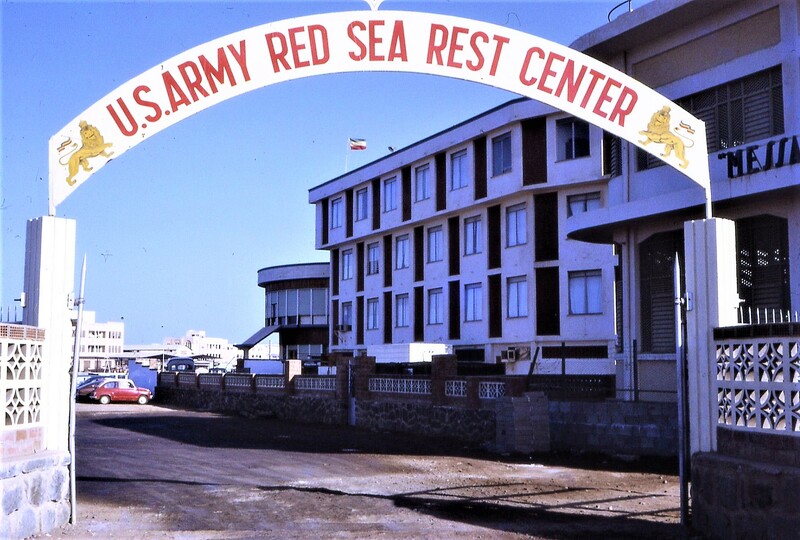 We could get necessaries in Massawa where the Army ran a supply depot and an R & R site. A bunch of us wanted to go into the city to a real bar with music and lights. Like this was Miami. Well there is only one place. The rooftop bar of the Hotel Torino. The hotel in the background – closed during the Eritrean War but now rebuilt and completely refurbished! On the roof of this “low budget” establishment was a bar from which you could see the sea. Around the edges a few potted palms and big Christmas style lights in Italy’s colors strung around the whole roof. There was a bar with stools and tables where one could sit alone, with friends or comely local girls. Above all there was live music! And a dance floor! A nice little Italian-Eritrean band played those Italian hits from the ‘30s. I could envision Mussolini’s picture and Italian Army Officers sitting under it in the very same spot sipping on a Compari and soda, cooled by a soft breeze from the sea. Followed by British Army Officers sipping gin. Followed by Americans drinking whatever was available. A truly zen moment indeed. It had been only 25 years since the end of WWII. For a young early 20 something dude today it was as if the greatest conflagration in human history ended in 1993 and the band was playing music from the ’80s. 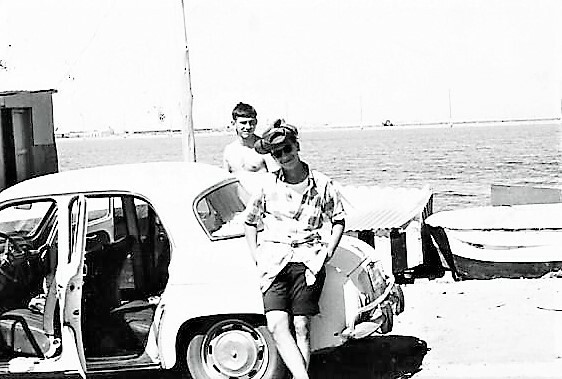 Toritto in Massawa -1965. I almost got killed in that Renault! “Compari soda piacere” for Toritto as he sat directly under where Il Duce’s picture used to hang, listening to “Perfidia” enjoying the moment in time. I knew it would never come for me again. Walking down the rickety stairs as I was leaving I realized that half the rooms contained young ladies of the evening. The price got lower as you approached the street. I was later told that everyone called the place the “Four floors of whores”. So much for ambiance. The Torino was built in the 1930s and had seen it all. It has been completely refurbished since and it can be seen on the internet in its new mint condition in case you’re hankering to sit where Toritto sat at 22. The modern fascist architecture of the day with a pinch of Ottoman is now considered art-deco. It’s still rated low budget and I’m sure it retains that touch of seediness kind of like an Italian-Eritrean version of Rick’s Café Americain, only outdoors. It’s a place to go for those adventurers who don’t want to travel on a guided tour. If you ever get there and sit in that roof top bar have a drink for me. strung above the roof top bar. Italian band plays thirties favorites. they dreamed of home, of Italy. I remember this post well, Frank, and enjoyed reading it again. This was a great post, Frank. I thoroughly enjoyed the read. I didn’t know you were stationed at Ft. Devens. I live in Groton, the next town over. Jennie – I was at Devens for the first 5 or 7 months of 1964. The Army Security Agency training school was there; it was where we learned our “snooping” skills. My brand new wife and I had an apartment on High Street in town and she worked at ITT. When I went to Africa she went home to her parents, got a job, saved our money and we were able to buy our own home before I got out in 1967. Regards.